(nee Race) May 25, 2017, age 82 years. 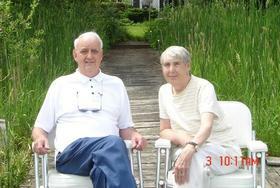 Beloved wife of Patrick Carroll for almost 58 years. Loving mother of The Very Rev. Kevin (Jane V.) Carroll of Milwaukee, WI, Michael (Leslie) Carroll of Appleton, WI, Cathy (Steve) Allen of Lakeville, MN, and the late Mary (Scott Breden) Carroll-Breden. Cherished grandmother of Madeline, Patrick, Christian, Samantha, Alexis and Nick. Dear sister of Linn (Richard) Mathes of Alachua, FL and Rita (Walter) Rojahn of Whitefish Bay, WI. Fond sister-in-law of John (Margie) Carroll and Susan Carroll Sheehan, both of Beloit. Further survived by nieces, nephews, other relatives and friends. Born in Green Bay, WI to Lincoln and Grace Race, Patricia graduated from UW-Madison with a B.A. in Journalism in 1957 then followed up with a B.S. in Horticulture in 1978. She went on to receive a Design Certificate from Ohio State University. Patricia was a devoted mother and also worked as the office manager for Carroll Electric. In 1979 she followed her passion and opened Willowbrook Nursery in 1979. In retirement, she and Patrick split their time between their cottage in Turtle Lake, WI and their home in downtown Milwaukee, WI. Family and Friends will gather on Saturday, June 3, 2017 at St. Paul’s Episcopal Church, 212 W. Grand Ave. Beloit, WI 53511 from 9:30 AM until the time of the Memorial Service at 10:30 AM. Interment will follow in the Church Columbarium. In lieu of flowers, memorials to Alzheimer’s Association of Southeastern Wisconsin, 620 S 76th St. Ste. 160, Milwaukee, WI 53214.